The battle in the heavy-duty pickup truck segment entered the new chapter with the arrival of the redesigned Ram and GM HD trucks. The new generation trucks improved the level of sophistication and capability and the recipe is similar as on the previously redesigned light-duty versions. An important fact is also Ram’s 1000 lb-ft of torque achieved with the reworked Cummins inline-6 diesel engine. However, Ford won’t also stay without the answer and the updated Ford Super Series will also hit the market as the 2020 models. Ford is working on the update just three years after the all-new 2017 Super Duty Series arrived and the reports suggest the extensive improvements in almost all aspects. 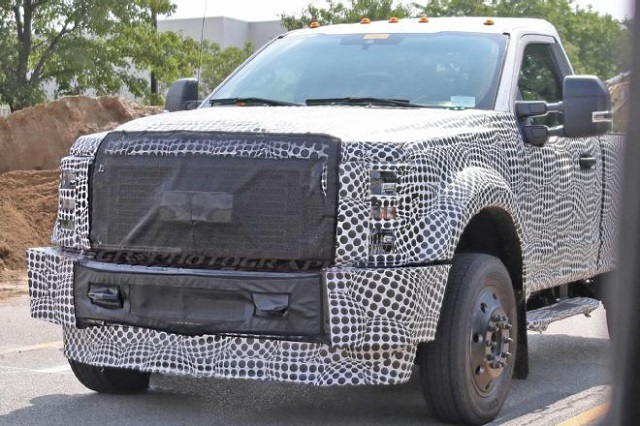 The prototype versions of all Super Duty models were spotted while testing and the most capable, non-commercial 2020 Ford F-450 Super Duty was also caught in the pre-production form. Like other versions, the F-450 will go on the market with the refreshed styling and improved interior and equipment features. The new transmission system will also be the part of the update and Ford should also provide better performance of the engines. Ford hasn’t revealed much about the mid-update of the Super Duty models but the spy photos and recent reports shed some light on the direction of the updates. 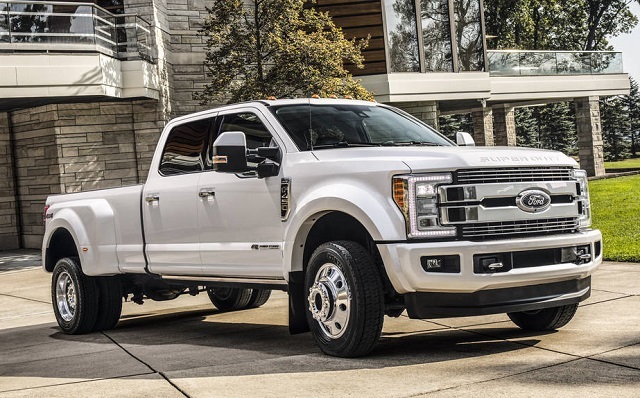 The 2020 Ford F-450 Super Duty and the rest of the Super Duty range will get refreshed styling and the reports indicate the similar changes as on the last mid-update of the light-duty F-150. The trucks should get the refreshed grille version and the prototype versions appear to have a more open grille design. The grille version will vary depending on the chosen trim and there will again be two-bar style and different patterns of the grille. The changes should also include a slightly changed design of the headlights and taillights while Ford won’t go with deeper, structural upgrades. There shouldn’t be radical moves in the interior design but Ford will update the tech and safety features and add fresh material and texture options. The heavy-weight truck will provide many tech and safety features. There will be the newest SYNC infotainment system on board and an array of the active safety systems. The truck will equip the safety systems such as the adaptive cruise control, surround view cameras, lane departure warning, forward collision warning with automatic emergency braking, etc. The model won’t also lack the high comfort features and will offer leather upholstery, heated and ventilated seats, heated steering wheel, driver memory setting, and more. As for the mechanical upgrades, Ford will introduce the new transmission system and there should be the engine performance upgrades as well. Ford hasn’t yet revealed details, but we know that the Super Duty Series will receive the new, heavy-duty 10-speed automatic transmission. The new transmission system used also in a number of other models like the Expedition and Lincoln Navigator should provide smoother shifting and some performance benefits. The 2020 Ford F-450 Super Duty will again use a turbocharged 6.7-liter V-8 diesel which provides up to 450 hp and 935 lb-ft of torque with the 6-speed automatic transmission in the current version. Ram revealed recently the improved Cummins inline-6 with the impressive 1000 lb-ft of torque while GM’s redesigned trucks stayed at 910 lb-ft. We will see the ratings of Ford’s turbodiesel engine. The updated 2020 Ford F-450 Super Duty will go on sale in late 2019. The price increase is expected but not radical.